Just like me, my son struggles with organization. Last Friday I urged him to clean out his backpack. “There’s nothing in there that shouldn’t be,” he said. When I promised to put all the binders and folders back in for him, he finally agreed. Just several inches, an entire can’s worth, of crushed sour cream and onion Pringles. Susan Kruger showed up in our lives. Well, her book did anyway. My favorite tool is the time management one Kruger uses for establishing priorities. The approach is so brilliant in its simplicity. Imagine you have a big empty glass jar. That jar represents the 24 hours in your day. Now fill that jar with rocks. For Tuck, it’s his math homework, studying for his French test, and talking to his teacher about a report. For me, it’s meal prep, laundry, bills, responding to correspondences, writing and exercise that comprise my rocks. 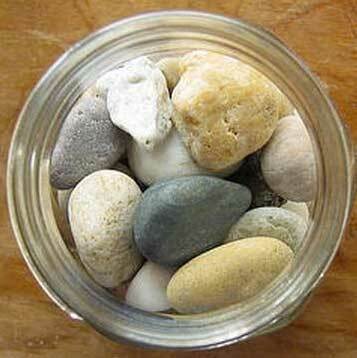 So now you have a jar full of rocks, but is the jar full? There are empty spaces in between all those rocks that can be filled with pebbles. Tuck’s pebbles are soccer practice, working on his mountain bike trails and hanging out with friends. Mine are tennis, yoga and coffee with a friend. But believe it or not, there is still room in the jar. Pour in water and it fills in the spaces between the rocks and pebbles. That’s the time left for Tucker to watch tv or play games on his Kindle or Wii. For me, it’s a 20 minute nap, sitting down with a book or watching my favorite t.v. program. And what Tuck and I have both realized, is that if we fill the jar with our pebbles and water first, there ‘aint no way to fit in those rocks. Essentially I’m still doing exactly what I’ve already been doing everyday, but the real difference is that I’ve categorized and prioritized everything. Old Way – Empty 1/2 the dishwasher… answer email…take Meg for a walk… answer phone…empty other 1/2 dishwasher…check Facebook…put breakfast dishes in dishwasher…put a load of laundry in washer…answer the phone…check email…jot writing idea down on slip of paper (later lose)…and on and on I go until I look up at the clock and it’s 2:45 and I’m late picking up the kids. New Rocks, Pebbles, Water System – In the morning I draw several circles on a piece of paper (my rocks) and begin filling them in. 1 hour household (clean up kitchen, plan dinner, laundry, bills etc). When that hour is up, I’m done. The rest can wait until tomorrow’s hour or I can pass on a couple of things to the kids as after-school chores. 1 hour communication, i.e. sit down at my desk and go though my email, Facebook and twitter, replying to whomever I need to. I also use this time for phone calls. Another hour is for writing. Another for exercise. You get the picture. Basically I’ve finally stopped flitting through my days and focus solely on the current task at hand. So by the time the kids get home from school, I feel like I’ve accomplished so much and can be wholly present to them, ready to kick around a soccer ball, play a board game or just hang out. Once their rocks are complete, that is! What about you? Do you or your child struggle with organization? Do you have favorite tricks or tools to share?